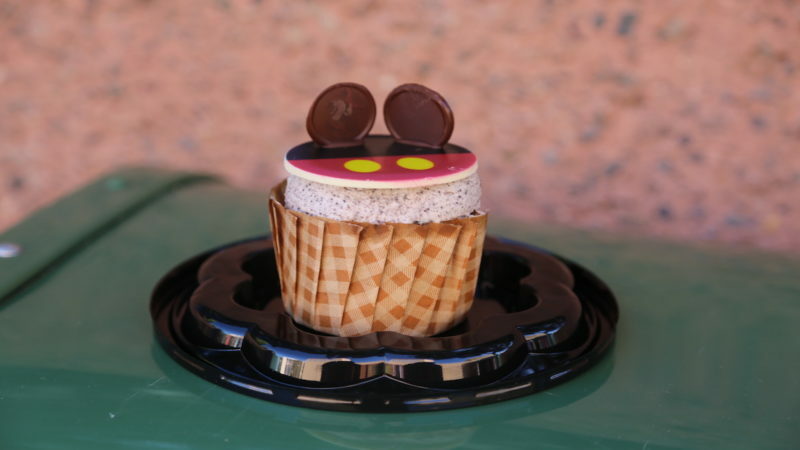 Wayfinding TravelingMom Jennifer Kaufman is on a mission to share the best Disney World snacks at each of the four parks (and beyond). She previously shared her top picks for the Magic Kingdom, and is back to talk about the best snacks at Epcot – specifically those you can find year-round. Jennifer and her family have enjoyed snacking in the Disney Parks for well over a decade, so this list has been well-researched. She even offers some tips for maximizing snack options if you’re utilizing one of the Disney Dining Plans. Epcot is one of the best places to snack around the world, but the options can be overwhelming. These are some great places to start! In a continuation of the conversation about best Disney World snacks, it’s time for the best snacks at Epcot! To be honest, the actual best snacks to try during your trip change more at Epcot than any other park, with all of the food-centric festivals taking place throughout the year. 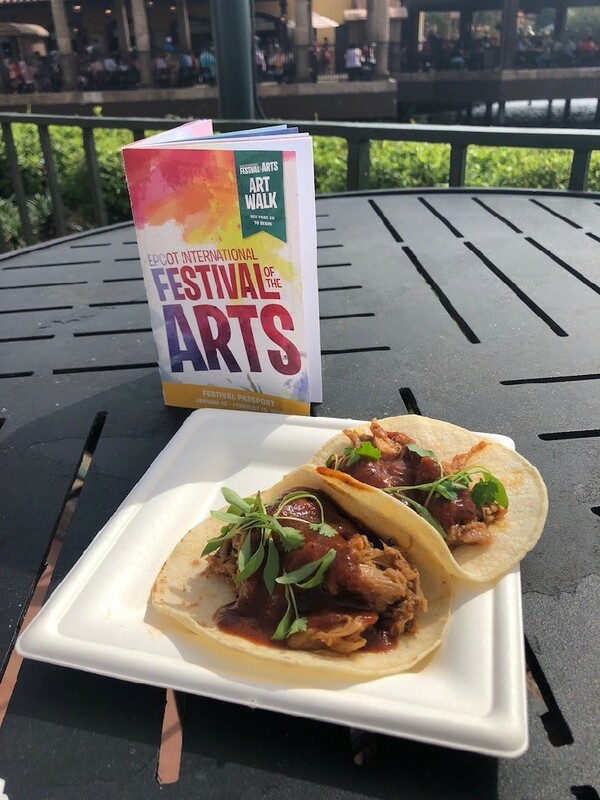 In addition to the International Food & Wine Festival, there are outdoor kitchens at the Festival of the Arts, International Flower & Garden Festival, and even the International Festival of the Holidays. Be sure to check out what limited-time items you might be able to find while you’re there; for my money though, these are the best snacks at Epcot that you can find at any time. For the record, this is available with sea salt on it, too… but that’s not the one you want. Nor is the dark chocolate caramel square. Actually, whatever your preference, Karamell Kuche has something that will likely become your new favorite treat. Warm, freshly made caramel popcorn, delectable (and beautiful!) caramel apples, a variety of candies – yum! Just the smell of this place justifies the often long wait in line. 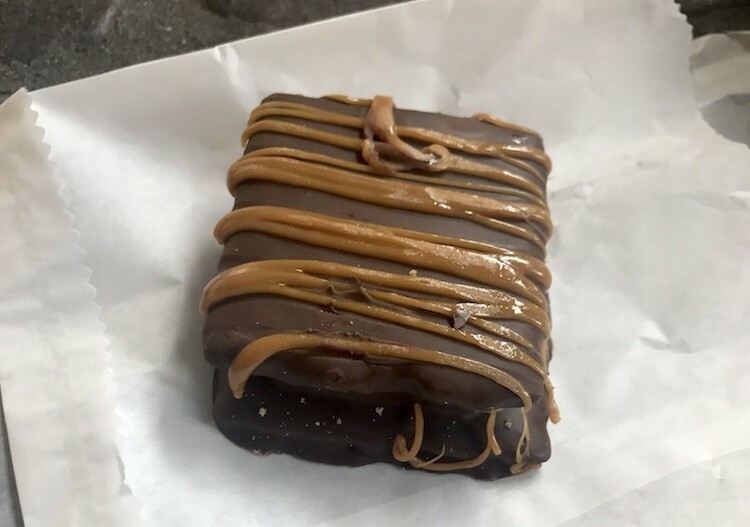 If you need a second recommendation after waiting, add a Chewy Caramel Bar. It’s definitely another fan favorite! Sunshine Seasons has been a favorite among Epcot fans for any meal, any time of day, for many years. The variety and value can’t be beat. 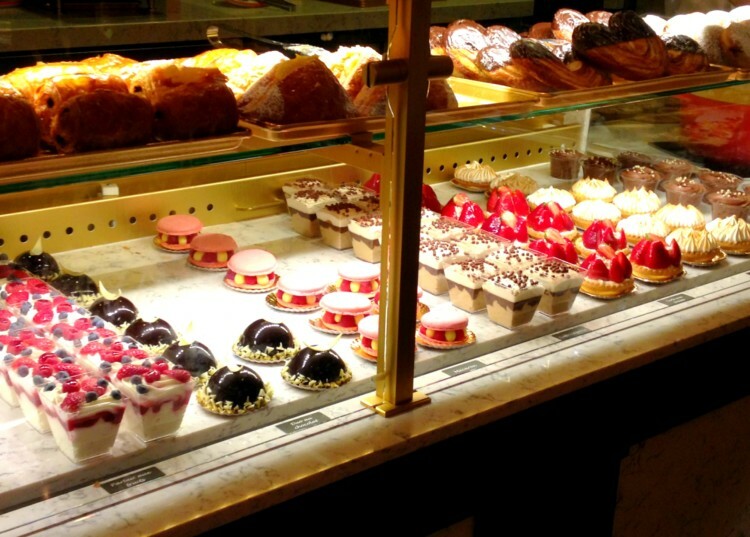 In addition to a great selection of food, the bakery is always worth a stop. Some of my favorite options include the S’mores brownie or the Creme Brûlée; it’s also a great place to find seasonal or celebration-specific cupcakes. I’m not the biggest pumpkin spice fan, and while I love a funnel cake every now and then, I don’t absolutely have to have one every time I’m somewhere I’m able. But if I’m going to have one, this is the one I want. The combination of funnel cake, pumpkin spice, and powdered sugar is just right! In each of the World Showcase pavilions, you’ll find a shop that has at least a handful of snacks that are native to the represented country. My kids absolutely love trying new candies when we travel, and traveling the world via World Showcase is no exception. Admittedly, because we have access to many of these locally (and many more that aren’t available in Epcot), we have stopped purchasing these on most of our vacations. However, if you can’t get these easily, sampling candies from each of the World Showcase pavilions is a must-do! A perennial favorite at the German Pavilion during the Food & Wine Festival, a similar (and equally delicious) version is available there year-round. Personally, I don’t enjoy dining in the Germany pavilion; the food is highly-regarded from people who actually like German cuisine, that’s simply not me. This dessert, though, is to die for. Warm vanilla sauce over a flaky, sweet, apple strudel? Yes, please! If you like frozen drinks, this is a must try. If you don’t really like them – and I’m generally with you – it’s still worth a look. It is so tasty! A patriotic-colored mixture of strawberry and blue raspberry slushes and vanilla soft-serve, it’s a favorite of ours. Find it at the American Adventure Pavilion. Then I went to Hawaii and enjoyed the most incredible shaved ice at Matsumoto – with sweet milk on top, as is apparently customary. It was so delicious, I didn’t hesitate trying Kaki Gori the next time I found myself in Epcot. It’s really not exactly the same, but it’s spectacular – especially on a hot Florida day! Yes, you can get these just about anywhere. Yes, I have them at least half a dozen times during the fall and holiday season, even when I’m not traveling. But there is something about getting them from the cart outside the Imagination Pavilion that gets me every time. Most of my “best snacks” lists – anywhere – aren’t going to include a lot of savory options; I’d probably eat some variety of chocolate for every meal if it were healthy and respectable to do so. There are a number of incredible options at Epcot though, that definitely qualify for any “Best of” list! There are chips available in kiosks along the promenade in World Showcase’s Mexico pavilion. Don’t stop there unless you’re in a hurry. There isn’t anything wrong with them per se, but if you have a few minutes to head inside the pyramid to La Cava, you won’t regret it. The chips, salsa, queso, and guacamole there are among the best I’ve had anywhere. I usually won’t turn away one of their top-notch margaritas, either. Again – I’m not one to opt for savory over sweet all that often, but this thing? It’s legitimately a meal, for under $4. Cheese and a croissant from a little French pastry shop? What’s not to love? TravelingMom Tip: This snack may be the single best value for your money anywhere on Walt Disney World property. Disney World snacks aren’t usually synonymous with incredible value, but this is just proof that there are hidden gems that offer just that. Another example is the Sweet and Spicy Chicken and Waffles, from Sleepy Hollow Refreshments in the Magic Kingdom. Do some reading before you go or, at the very least, keep your eyes peeled while looking for food and snacks during your trip! China’s Joy of Tea offers soft, sweet bread, filled with warm pork barbecue. It’s my favorite item on the menu, but – especially after traveling to China and expanding my horizons a bit – they offer quite a few great choices. If you don’t see anything there that you want, pop into the nearby Lotus Blossom Cafe for some potstickers to tide you over until dinner. Delicious! The Croissant Donut from Refreshment Port was a bit of a letdown for me… but then I had a savory trio of sandwiches at the Festival of the Arts that each had cronut base. I’m not sure I’ve stopped thinking of them since, so don’t count the Cronut-esque treat out. Similarly, the Croque Glaces from the France Pavilion’s L’Aritsans de Glaces – a hand-pressed ice cream sandwich on a warm brioche bun – gets rave reviews from many guests, my husband included. It’s totally not my style, but I often seem to be in the minority. Besides, if you’re an ice cream fan and you find the Croque Glaces doesn’t look appealing, you’re still in the right spot for some excellent ice cream! Once upon a time, the Disney Dining Plan snack credit was only good for a handful of select items; we grew kind of tired of rice krispy treats, packaged chips, and the other snacks that were included. 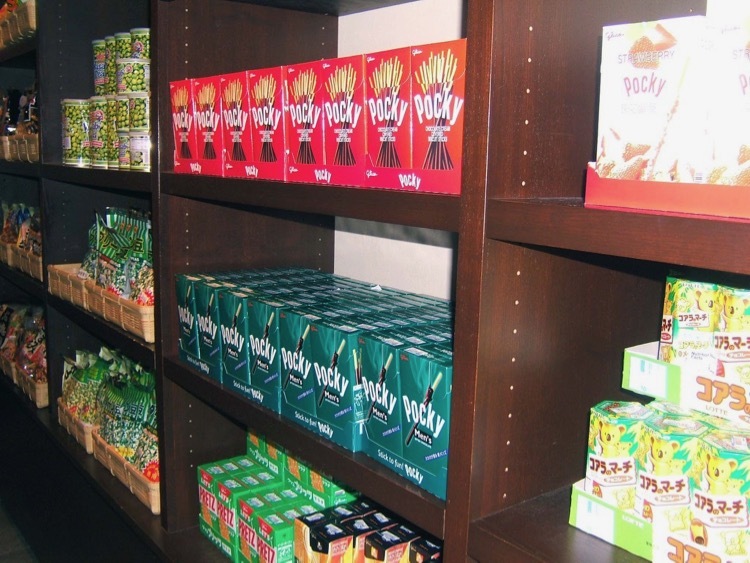 Thankfully, you can now use those snack credits for countless items throughout the Walt Disney World Resort. While there is no official list of eligible items, you’ll find the purple and white “DDP” symbol by food items at nearly every quick service and kiosk dining location. In general, it’s worth asking about using a snack credit if an item is approximately $5 or less, though even that price point has gone up over the years. In most cases, any single-serving snack or side item, non-alcoholic beverage, or dessert, and many sizes of pre-packaged items can be purchased with one credit. There is no better time or place to use your Disney Dining Plan snack credits, in my opinion, than during a Festival at Epcot. 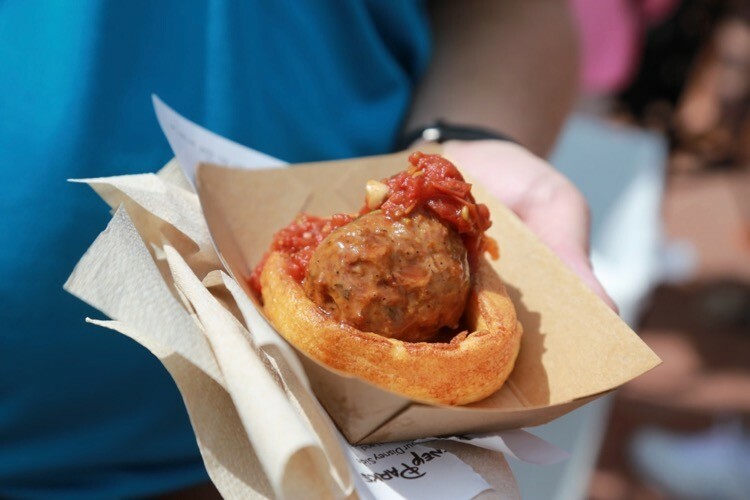 Food and Wine Festival booths and the outdoor kitchens at the other Festivals and special events often accept a dining plan snack option for almost all of the food items. Usually samplers like the cheese plates and other similar tasting plates are excluded. SHOULD YOU GET A DISNEY DINING PLAN? Not sure if a Disney Dining Plan is for you? We used to get it every trip; then, we’d do a lot of calculations to see if it was worth it on each particular trip, opting to purchase one about every three visits. Today, we don’t even look into it. Don’t worry though! TravelingMom has you covered with these two looks at Disney Dining Plans, and how to decide what is right for your family. Headed to the happiest place on earth? Traveling Mom recommends Undercover Tourist for discounted tickets. We may receive a small commission for any purchases for our links, but many Traveling Moms use Undercover Tourist and recommend them without reservation. NOW I WANT TO KNOW: WHAT RANKS ON YOUR LIST OF MUST-HAVE TREATS AT EPCOT? Jennifer Kaufman is a stay-at-home mom of three travel-crazy kids: 10-year-old twin girls, and their 5-year-old little brother. Commonly known as “that Disney family”, she and her husband have discovered that the very things that draw them to Disney destinations – the story, the attention to detail, and the “little things” – can often be found anywhere they look. She has always had an insurmountable case of wanderlust, daydreaming of what it would be like to pick up the family and move to Europe for a few years, or perhaps live off of a boat for a while. As she waits for such a grand adventure, she has dedicated herself to exploring the stories and details wherever she travels, and finding the joy in the everyday moments at home. 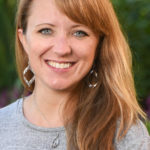 Jennifer and her family can be found in articles, videos, and podcast episodes at The Delightful Life.